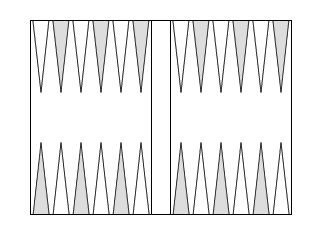 Proper doubling technique involves more than making theoretically correct doubles. It is important to understand your opponent's tendencies to take or pass close doubles in order to make the most of the cube. In general, you should double early if your opponent tends to pass a lot of doubles, but double late if you are playing against a taker. However, it is not quite that simple. What you are really trying to do is to manipulate the cube so that there is a good chance your opponent will make a mistake, either taking a double that should be passed or passing a double that should be taken. If you can do this, you have achieved maximum benefit from the cube. Coward: Tends to drop several takeable doubles. Conservative: Tends to drop the close ones. Aggressive: Tends to make some questionable takes. Reckless: Tends to take anything which has play. Let's examine a few positions and see what our cube action should be against each of these opponents. In Position 1, Black has a 13 pip lead. White barely has a take on the race alone and the added possibility of hitting a shot makes the take even clearer. However, Black does have some market losers, and nothing bad can happen on the next roll. Against Coward, double. Who knows? He might even drop, which would be great. If he takes it is no disaster, since the double is probably theoretically correct due to the market losers. Against Conservative, wait a roll. What you are hoping for is a mild improvement, such as clearing your midpoint with a 5-3 or a gain in the race. Then you can double, and he is likely to drop a position which is still a take. If you double now he will surely take, but he might make a mistake later. Against Aggressive, double. He won't be dropping any takeable doubles, so you should double to avoid losing your market in case you roll a good set. This is not the type of position in which Aggressive is likely to make an error. Against Reckless, wait a roll. Even if you roll something like double 3's, you may find him still taking. It is hard to lose your market against him in this position. In Position 2 you can double, which your opponent should certainly pass, or you can play on for the gammon. Playing on is not without immediate risks (imagine 2-2 on his next roll! ), and even if you do good things there will be later danger because of his anchor. However, he is unlikely to turn the tables in one roll, so you have a reasonably safe shot for now. Against Coward, wait. Your plan will be to hit lose on the 3-point if you can't make it, and if he hits you back then double him. He will probably have a take on this scenario, but this sort of player will almost certainly pass. Consequently it is quite safe to play for the gammon, for you will be able to double him out if necessary on all but the worst sequences. Against Conservative, double and claim your point. He isn't likely to make a bad cube decision later in this type of position, and it isn't quite worth going for the gammon due to the immediate and later danger. Against Aggressive, wait a roll. Here, your game plan is to make your bar point in preference to hitting loose on the 3-point. If he makes your 3-point, you can then double him. His timing for the 1-3 back game is poor, so the double should be dropped. However, this is the type of position Aggressive is likely to make one of his bad takes, so by waiting you give him a chance to make an error. Against Reckless, double. His position has some play, and there is a reasonable chance that he will take the double, which gives you potentially the best possible result. In Position 3, Black has the lead in development and a few killing rolls. If he rolls one of them he may lose his market, but if not it could be a fairly even game although Black will retain the advantage in almost all sequences. Against Coward, wait a roll. Even Coward will take if you double now, but he might not if you make any further improvement. For example, if you hit loose on the 5-point and don't get hit back, Coward will probably drop a takeable double. This is the mistake you are angling for. Against both Conservative and Aggressive, double. They are not likely to make any serious errors here. They will both drop if you roll a killer, but take if you don't. Your position is strong and you have some market losers, so it is correct to double. Against Reckless, wait. He may well take even if you make the 5-point and he does nothing. If you can't lose your market, it is never correct to double.